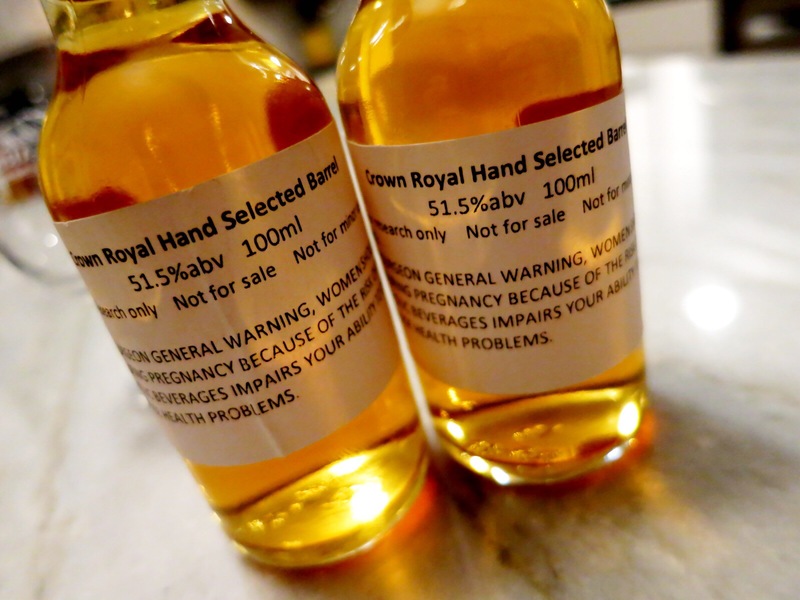 The other day, G-LO opened some recently received boozemail and discovered samples of two different whiskies from Crown Royal. He tackled the Northern Harvest Rye review and I took on the Hand Selected Barrel review. Over the years, we have reviewed the XR, the Maple, the XO, the Monarch 75th Anniversary Blend, and the Regal Apple. As you can see from the list above, we have had the opportunity to sample several Crown Royal expressions. Some of have been very good (the XO and the Monarch), and some … eh, not so much (the Apple was just not to my liking). So, I was intrigued to try the Hand Selected Barrel. Originally produced for the Texas market, it is now available in other select US markets and offers a chance to sample a whiskey crafted with a rather unique rye flavor profile that results from the use of the only known Coffey still in North America. The aromas are rich and robust on the nose with slight hints of vanilla and fruit. The taste is an exceptionally smooth blend balanced by creamy and fruity notes of banana and rich oak undertones from maturing in new American wood resulting in a long lasting and expansive finish. The liquid is made up of 64% corn, 31.5% rye, and 4.5 % malted barley. Appearance: Taupe color… it’s very soothing (this is G-LO’s description. I heard taupe and I thought again about what an over-descriptive douche he can be at times!). Limpd: Lots of alcohol vapor that has a bit of rubbing alcohol quality along with some vanilla, allspice, and a bit of the barrel. Limpd: Sweet maple & brown sugar with just the right amount of heat; almost like a sweeter version of Big Red gum. The heat is consistent from mid-palate through to the relatively short finish. G-LO: Packs quite a wallop! Starts off with a blast of cinnamon, vanilla, and clove. Some baked apple notes come through in the middle. At the finish, things get dry and a touch bitter with a lingering dried fruit and cinnamon aftertaste. Limpd: I liked this. Not overly complex or terribly complicated. Just a good sipping whiskey with just enough of a punch (at 103 proof) to make it worthwhile. If it had a longer finish, I would have really loved it. G-LO: I really like the nose on this, but the taste is a touch disappointing. I enjoyed the intensity of the higher ABV, but felt that I didn’t get everything in the nose coming through to the palate. It was good, but it wasn’t as great as I’d hoped it would be. Many thanks to Taylor Strategy for sending us this generous sample! Hey, I was just having a laugh. You provide a nice counter balance to my review. You mention Sultana figs and Kopi Luwak and I note that me likey whiskey! As well you should. You have elevated to an art form. NOW you’ve gone too far. An art form?? ?